By Steve Hawthorne and Graham Kendrick. 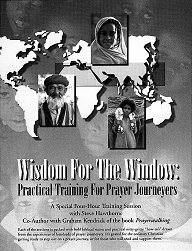 Biblically-based, practical approaches to on-site prayer amidst the least evangelized world. Useful for prayerwalking anywhere, the series provides a dynamic introduction to prayerwalking. 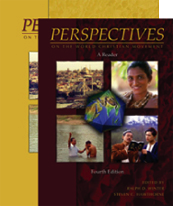 Perspectives Reader and Study Guide, 4th Ed. Perspectives on the World Christian Movement is a collection of readings exploring the biblical, historical, cultural, and strategic dimensions of world evangelization. Writings from more than 150 mission scholars and practitioners introduce lay people and students to the astounding potential of the global Christian movement. Each of the 170 articles offers practical wisdom enabling Christians to labor together in bold, biblical hope to finish the task of seeing Christ named and followed in every people group. The Perspectives Study Guide may be more important than the Perspectives Reader. This IS the course. The reader is like the grocery store. The study guide works like a menu and a cookbook, helping you find your way through the Perspectives course. 15 lessons. Includes questions, helpful comments, and additional readings.